In the young 2015 NFL season, there are already a few glaring examples of schism between player and scheme. It seems like a simple conceit: Take a dynamic playmaker on either side of the ball, add him to your already impressive mixture of scheme and personnel, and the results will benefit everyone involved. It happens every year, but the inverse phenomenon seems just as common: A player's productivity nosedives because his talents don't fit the vision of a coaching staff, and everybody suffers for it. The Redskins trying Albert Haynesworth as a two-gapping defensive tackle, the Buccaneers insisting that Darrelle Revis play passive zone defense, the Eagles trying to turn Nnamdi Asomugha into a safety, the Chiefs deeming Brandon Flowers expendable when they went to more of a man defense, Jay Gruden insisting that Robert Griffin III play the game his way ... the road is littered with the careers of players who went to the wrong place and suffered for it, because a coaching staff refused to realize which players best fit their schemes and further refused to adapt to the players they had. In the young 2015 season, there are already a few examples of schism between player and scheme, and the most obvious issue currently resides in the Emerald City. When the Seahawks traded their 2015 first-round pick and starting center Max Unger to the Saints for tight end Jimmy Graham in March, it was believed to be the acquisition that would put Seattle's offense over the top and make the defending NFC champs nearly unbeatable. Put Graham in with Seattle's good-but-not-great receiver corps, add in their dominant run game and defense, and the mind reeled. Graham was just as excited about the possibilities ... back then. That was the idea. The Seahawks would use Graham as a seam and post target, as he often had been for the Saints in Sean Payton's offense, and he'd use his physical dominance and basketball skills to round out Seattle's passing game and force defenses into impossible situations. Needless to say, that hasn't happened. Through his first five games with the Seahawks, Graham has caught 21 passes on 27 targets for 204 yards and two touchdowns, which puts him on pace for a 2015 season in which he'd catch 67 passes on 86 targets for 653 yards and six touchdowns. These would all be by far Graham's lowest season totals since his 2010 rookie season, when he played just 238 snaps. In 2014, even when he was suffering through various injuries and New Orleans’s offensive line was in free-fall, Graham still caught 85 passes on 124 targets for 889 yards and 10 touchdowns. The Seahawks have essentially negated Graham as a deep and red zone target, insisting that he become a more traditional blocking tight end—perhaps, in part, to compensate for an underperforming offensive line that was faulty in its construction. And it's pretty remarkable how quickly Seahawks offensive coordinator Darrell Bevell switched his opinion regarding Graham's role. Less than a month later, with local media all over him regarding Graham's inexplicable lack of targets, Bevell was singing a very different tune. Why Bevell and the team would want to turn Graham into a blocking tight end who catches the occasional pass in a rotation with less proven playmakers is a mystery, but the disconnect is showing on the field. In the much-maligned Bevell's defense, we suppose, he's not the only coach in the NFL who currently finds himself completely confused regarding the proper usage of a highly gifted and recently acquired asset. A Chip off the old block? Not quite. When the Eagles signed free agent running back DeMarco Murray to a five-year, $40 million contract on March 12, it seemed like a double net gain for Chip Kelly's team. Not only would Philly gain a rushing champion, but they would take that offensive centerpiece away from the division rival Cowboys, who had seemingly become convinced that anyone could run behind their offensive line. That's not been proven true in Big D at all—Joseph Randle leads the team with 289 yards and four touchdowns on 74 carries—but that's a big deal compared to what Murray, who ran for 1,845 yards and 13 touchdowns on 392 carries in 2014, has done for the Eagles so far. Murray has just 130 rushing yards and two touchdowns on 49 carries. He’s already beefed about his workload in a running back rotation with Ryan Mathews and Darren Sproles, but he doesn't have much of a case. No back on pace for 416 yards and six touchdowns on 157 carries really does. What happened here? The common narrative is that behind an inferior offensive line, Murray simply doesn't have the burst and aggression to make plays outside of dominant blocking. The common narrative is incorrect. In 2014, per Pro Football Focus, Murray ranked second behind Marshawn Lynch with 67 missed tackles caused on his runs, and he led the NFL with 998 yards after first contact. In Dallas’s combination of outside zone and inside power blocking, Murray was the perfect foil. He could take his time, pick his spots, get a head of steam going, and that's when things got interesting for opposing defenses. But the combination of inside zone and poor overall blocking in his new home helped lead to Murray’s swift early decline. Last Sunday’s Eagles win over the Saints was seen as a step in the right direction, as Murray ran for 83 yards and a touchdown on 24 carries. There were still a lot of short plays in which Murray was overwhelmed by defenders inside, but this 24-yard run with 12:30 left in the first half seemed to be a better marriage of player and scheme. Get Murray running on the outside track with a motioning tight end and a pulling left guard leading the way, and you're finally building a structure for his success. This concept was especially intriguing given that the previous play was more like what we've seen from the Murray/Eagles combo this year—the blocking and the back looking not in sync, and the back having to bounce outside against a defense that had closed all inside gaps. That was a three-yard gain on a standard-issue cutback. Again, Murray isn't a runner who is optimized to blast through holes quickly like Mathews and, to a lesser extent, Sproles. He's a sustaining track runner on outside zone, and an inside power/counter/trap runner who needs clear openings to do what he does best. That one run represents a step in the right direction, and Kelly was sure to point out after the game that he called more outside runs than in any other game this season. The only question is, what took him so long to do so in a way that best benefited his prized acquisition? We'll see how (and if) the new philosophy holds up against the Giants’ estimable run defense next Monday. Of course, it’s not always a new player who presents an issue. There are also new head coaches who come into situations that work very well and tinker for their own reasons. Perhaps the most obvious example of this phenomenon this season took place when Gary Kubiak replaced John Fox as the Broncos’ coach. 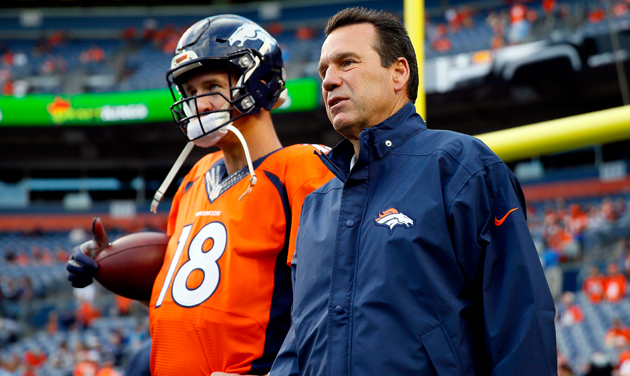 The Broncos are 5-0, but the Manning-Kubiak partnership has been inconsistent so far. Throughout his coaching tenure in the NFL, Kubiak has depended on a passing game heavy in fairly predictable routes with boot-action as a major factor, along with a run game made strong by zone blocking and quick cutback runners. How was that going to work with a 39-year-old quarterback in Peyton Manning, an offensive line decimated by injury and attrition, and an inconsistent battery of backs? The system Kubiak uses, with its heavy roots in the schemes designed by Alex Gibbs over the decades, has made dominant lines out of replacement-level talent and taken formerly underwhelming backs to new heights. This year, that's not happening. The Broncos are 5–0, but that's mainly due to a defense coached brilliantly by Wade Phillips (perhaps the best example this season of a new coach coming in and maxing out the abilities of his players, by the way). Phillips’s understanding of his personnel made Kubiak’s adherence to his own philosophies even more frustrating. Through his time in Denver, Manning has excelled out of the shotgun and Pistol formations—they give him more time and advantageous angles to read the field and decipher what enemy defenses are doing pre-snap. But Kubiak, whose Ravens offense lined up in shotgun a league-low 24.1% of their snaps in 2014, started the season with a firm grasp of what Manning should do, and it was completely counter to what Manning had been doing in recent years. The 2014 Broncos operated out of shotgun or pistol on 73% of their snaps in 2014, and they were far more efficient when doing so, ranking fourth in Football Outsiders’ opponent-adjusted offensive metrics when in shotgun/pistol, and 11th when Manning was under center. Denver's offense was good for 6.6 yards per play when Manning was not under center last season and 5.4 when he was. That’s skewed to a point by the percentage of plays in which the Broncos ran when Manning was under center, but given how often they ran out of pistol, not as much as you might think. This season, Denver has been in shotgun/pistol 76.1% of the time, but that’s the result of a severe course correction on Kubiak’s part after the team’s first two games. According to data provided to SI.com by Sam Monson of Pro Football Focus, Manning lined up under center a total of 57 times, in shotgun 80 times and in pistol just twice. Why the alteration? It's strange, because Kubiak and offensive coordinator Rick Dennison had success in Houston with backup quarterback Case Keenum in the pistol for a time in 2013. Starting his first NFL game against a very game Chiefs defense in an offense that had been rattled by Matt Schaub’s record-setting proclivity for pick-sixes, Keenum was put in a position to succeed by his coaches with a formation familiar to him and completed 15 of 25 passes for 271 yards, a touchdown, and no interceptions. So, why wouldn't Kubiak give the same consideration to his future Hall-of-Fame quarterback now, especially when that future Hall-of-Fame quarterback is dealing with some pretty obvious physical limitations at this point in his career? I mean, really. Peyton Manning throwing off boot-action? Who are we kidding here? Whatever happened, Denver’s offense became a lot more balanced in Week 3 and beyond. Though five games, the Broncos have run 75 plays under center, 153 in shotgun and 81 in pistol. Problem solved? Well, sort of. Manning’s statistical and on-field inconsistencies have to do with a lot more than where he's lining up on the field, but the really odd thing is that Denver isn't passing out of the pistol all that often: just 36 attempts and 24 completions for 327 yards, no touchdowns and an interception. He's been most efficient under center this year, though the sample size is small: 11 of 20 for 50 yards, two touchdowns and no picks, which would lead to the conclusion that this is a heavy goal-line offense. Mostly, he's been throwing out of the shotgun, and it hasn't been working as it once did. He's completed 85 of 133 passes from the shotgun for 869 yards, four touchdowns and seven interceptions. Why would there be just 36 called passes (minus any sacks) on 81 pistol plays? That's something only Kubiak can answer, but you can bet that the questions will keep coming. That's what happens to coaches who create curious schematic situations. They're generally made to answer for it publicly first, and often to their bosses later. Kevin Coyle, the recently fired Dolphins defensive coordinator who wanted Ndamukong Suh to soak up blockers, Haynesworth-style, could tell you all about that.